Mud runs are spectacular ways to get exercise and challenge the body. This is largely thanks to the obstacles most event planners for mud runs put in place. It is not just about running. A good mud run will work the upper body, core and lower body. Some obstacles are also there to add resistance. For example, having to run through water makes the legs work harder. Mud pits are par for course in a mud run. All participants should expect to get wet, dirty and uncomfortable. That is the nature of mud runs. It may also be very cold. This is why veterans suggest certain types of clothing for mud runs, so squishy shoes and dripping clothes do not slow runners down. Push-ups: Do sets of pushups before, during and after runs so the upper body gets accustomed to using upper body strength while winded from running. Playground obstacles: Go to the local playground and use their cargo nets, tire climbs and ropes to train. Use mud to slicken up the hands first. Grip will be a problem at the run. Run around the playground before climbing for an experience more typical of a mud run. Pull-ups and chin-ups: Do as many of these as possible as often as possible. Hay bales: These may be arranged so people go up and over them on all fours or like staircases. Hills: Mud run events do hills with a vengeance. Do not be surprised to encounter hills covered with tires. Swims: Definitely make sure swimming is a strong suit before entering a mud run. Monkey bars: This is another area where playground training will come in handy. Mud race planners are not always open about every obstacle before the race. That is why interval training, cardio, full body and mind workouts are essential to mud run training. 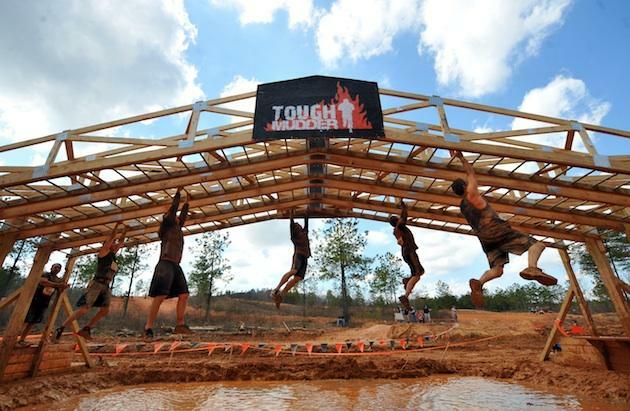 A body that is ready for anything is ready for a mud race. A person who cannot do a pull-up will not have a good time.